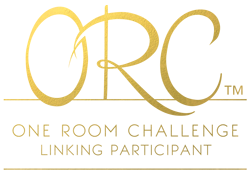 As many of you know, my older two children passed away from Mitochondrial disease, because of this I have become part of a very large "community" of families who have given me much love, support and knowledge during our journey. One of these families contacted me about doing a custom sign for her daughter Isabella's room. 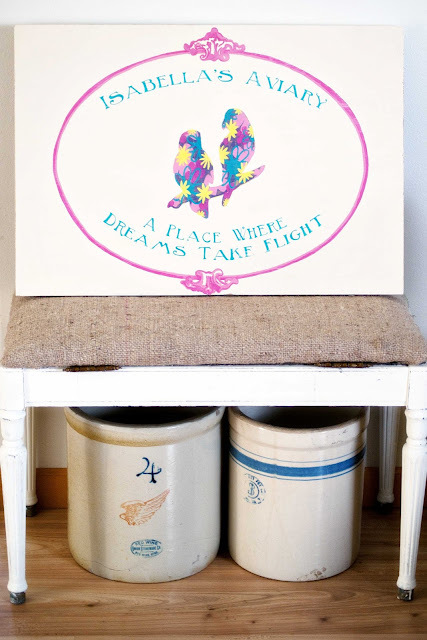 It was inspired by a very unique and totally amazing charity they are starting, called Isabella's Aviary. 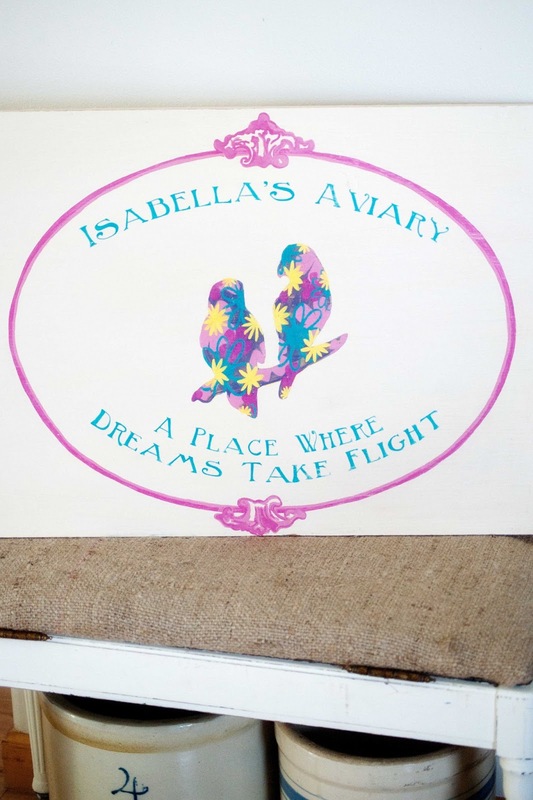 "Isabella's Aviary, a place where dreams fly,” is a foundation created to honor Isabella(10), who has a neurodegenerative disease that has advanced a lot in the last year, by her mom Trisha. Belle and her mom share a passion for birds and have always dreamed of raising their own. Believing smaller birds are one of the best pets available, they will be hand-raising small birds and training them to be companion animals for special needs kids who can't have or handle cats and dogs. Currently they have three breeding pairs that are quiet, smart, and easy to care for. As Belle's condition has deteriorated, her birds seem to make her heart and soul shine in a way nothing else does anymore. Watching her dreams unfold has made her happier, more engaged, and she even seems to have more energy! Proof that dreams, passion, and love heal the spirit even when medicine fails the body! This inspired the idea that other kids struggling with pain, fear, loneliness, and loss might also benefit from sharing a relationship with a bonded feathered friend! 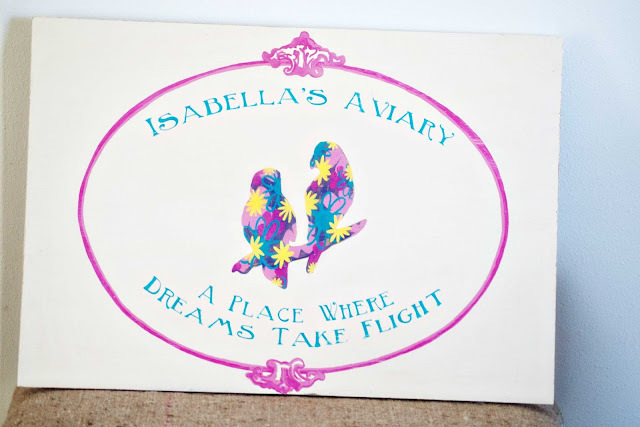 The goal is to have "Isabella’s Aviary, a place where dreams take flight", under a 501c (charity) status soon. 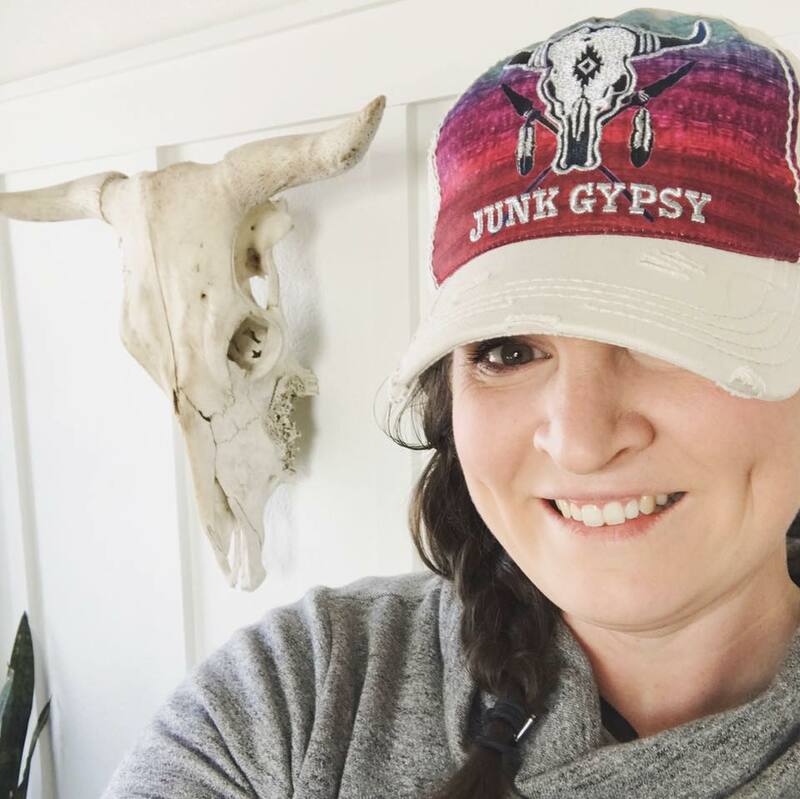 Trisha is assembling a board of experts in the avian field, medical/developmental professionals, and special needs parents to provide core direction and guidance the foundation and the advocacy for the children and birds involved in the program. You can follow the updates on Belle, the birds, breeding, and process of setting up a charity HERE . 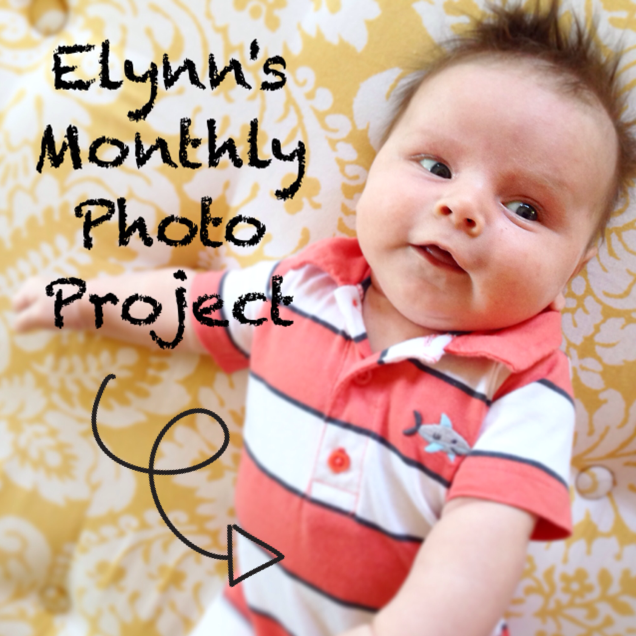 They welcome your thoughts, advice, support, and eventual donations! I had so much fun designing and painting this sign for Belle, I think it captures the personality of a beautiful and strong little girl. Amber, this is such a beautiful sign for a beautiful cause!!! You did a great job! Thank you! It was very fun to do! What a beautiful sign and an amazing young girl!!! I am blessed to be able to do something like this for her! 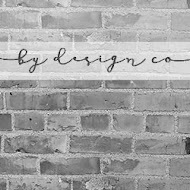 Awesome organization and awesome dsign for an awesome little girl! Oh my, bless you for all you have been through and how strong of a woman and mother you are. That sign is BEAUTIFUL!!! We just had a Double Yellow Amazon Parrot pass who had been a big part of our family & just loved our kids! I wanted you to know that I've nominated you for a Liebster Blog Award. The information can be found here: http://day2daysupermom.blogspot.com/2013/04/liebster-award-sisterhood-saturday.html Have a wonderful day!